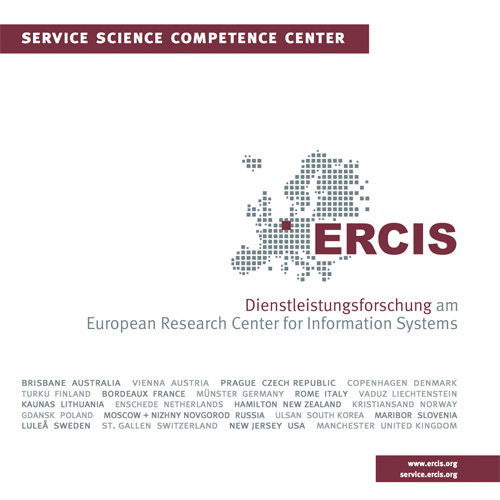 Cooperation Experience | ERCIS Competence Center "Service Science"
Today, successful innovations in business models increasingly take place in the form of product service system (PSS) networks that allow combining the skills and performance contributions of different partners of the value chain to new and innovative customer solutions. Among the potential benefits that are associated with the offering of product service systems a stronger differentiation from competitors, an increase in customer satisfaction and retention, and a potential for enhanced resource efficiency across the network can be named. One of the major obstacles for the realization of these potential benefits lies in the aspect that the complexity that arises from the requirement for integrating the heterogeneous involved actors of the PSS network is not yet mastered. Thus, innovative projects fail, for example, due to a missing consensus and transparency about the information requirements associated with the various actors during the life cycle of the PSS network. There is a lack of methodological approaches that allow an early experience of the actors’ integration across the network and that hence facilitate an early assessment of these networks. The Cooperation Experience project’s main goal lies in the research for an innovative conception method that supports the demand-driven coordination of product and service providers within a product service system network. This method shall be characterized by its capability to visualize the planning of the back-office integration in PSS networks and by its suitability to allow a most direct experience of the network as a part of a software-based test environment. Application domains are the planning and operating of facilities and the mechanical engineering. A parallel adaptation and development of domain-specific reference models shall show, how actors can match their tangible and intangible offerings along the product life cycle in an innovative way, for cooperatively achieving demanding economic, social, and environmental objectives. Parts of these reference models will be integrated into the modeling environment as templates or best practices knowledge allowing an effective application of the newly designed methodology. Overall, the development efforts resort to the basics of modeling in the Information Systems discipline and the approaches of model driven development and configurative reference modeling. The Cooperation Experience project is kindly supported by German Ministry of Education and Research (promotion sign: 01XZ13013). More information is available at: http://www.cooperation-experience.de.